“Now, concerning food sacrificed to idols: we know that ‘all of us possess knowledge.’ Knowledge puffs up, but love builds up. Anyone who claims to know something does not yet have the necessary knowledge; but anyone who loves God is known by God. And so to this church, comprised of those called to be saints together, Paul offered instruction. Ample, and detailed instruction…with many commas. The Corinthian church had a number of members who were reasonably wealthy, reasonably educated, reasonably sophisticated people. They were comfortable in the knowledge, based in Holy Scripture, that idols do not exist. And so they were also confident in the practice of eating meat, sold in the markets, which had begun as an offering in the temple to idols. Life among this group at that time involved a number of parties, receptions, banquets, and public celebrations. And each of these was an occasions to eat good food, which meant people shopping for their own households and guests at the same markets that sold the meat that had been a temple offering. The church at Corinth was not comprised only of this refined group of people, though. It included regular folks, too, people who worked for a living. It included slaves, and poor people, people who didn’t have the money to shop at those temple markets. And many of them had only just left the culture in which their two hard-earned coins would have purchased a dove to be sacrificed at the temple. These members were recent converts to the Christian life. They didn’t know the Scriptures yet. They weren’t experienced. They had only just accepted the invitation to “come and see.” They were learning how to love God in this new way. So for them to assume the liberty being asserted by their fellow members could be confusing at best, if not outright harmful, to their new life of faith. And the tricky thing about all of this is that, in terms of theology and understanding, Paul agreed with the sophisticates. In fact, they probably believed and practiced as they did because of Paul’s own teachings. They knew the Shema of Israel: “The Lord your God: the Lord is one.” Paul knew that idols are not real, and would have said so. He knew that food has no impact on either our salvation or our condemnation, and he would have taught that, too. Food is at the center of a lot of what we do, in whole of the Christian faith and especially here at St. Augustine’s Church. Every Sunday, our worship focuses on a sacred feast – one to which everybody is welcome. After we meet today for our Annual Meeting, to share stories of this past year and hope for the future that lies ahead of us, we will continue in fellowship over the food that you all have brought to share: homemade soup and salad and bread and desserts. Many of you know that I have Celiac Disease, which means that my body can’t tolerate the gluten found in regular bread and other foods. Now, you have the freedom to eat whatever you like and what nourishes your bodies. But I can tell you the blessing that it has been for me, the ways that you have extended yourselves to make sure that there is food safe for me, and for others, to eat when we gather, so that we can all join together at the table, so that we can all take part in the fellowship that food provides. This is to say that the specifics of things matter – food and drink and fellowship, the hospitality extended in the life of the community and the nourishing of this Body – that matters. Choosing to be a part of the Body of Christ means choosing to belong to one another. We can’t do that in isolation. Our faith cannot be only abstract. It has to be made manifest, in who we love and how we live. Does knowledge matter? Absolutely it does. But having the right answer is not the only thing that is important. Because relationships matter, too. What we do – right down to the practicalities of the food we share – affects who we are, together, and it has, since the earliest moments that the church was church. · Who is here, and who is not here? · When are we silent? · What do we pay attention to? · What is our relationship to this neighborhood? · How do things feel to you at St. A’s right now? · How are children treated? · How do we handle conflict? We will do this as a church comprised of members who have been part of this Body for decades, and we will do this as a church comprised of members who walked through this door for the very first time a week ago…or maybe even this morning. And my sisters and brothers, we are all, together, the beloved Body of Christ. 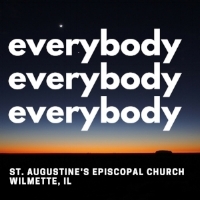 We all belong to one another: everybody, everybody, everybody. I give thanks for the conversations we will share today, and for those that lie ahead of us. I give thanks for the life we share in common, set within our love of the God who knows us. I give thanks for the fact that you are the church that I love and am called to serve. And I pray that in all that we do, we will strive to build up this Body, this church. Because just as the members of the church at Corinth, so many years ago, I believe that you, each one of you, is sanctified in Christ Jesus. I believe that we are all called to be saints, together, with those who in every place and at every time call on the name of our Lord Jesus. And, together with the apostle Paul, I wish you grace. And peace. V. Bruce Rigdon, “1 Corinthians 8:1-13: Pastoral Perspective.” Feasting on the Word: Year B, Volume 1. Louisville: Westminster John Knox Press, 2008. 302. Much of this sermon is informed by Rigdon’s essay, for which I am grateful.